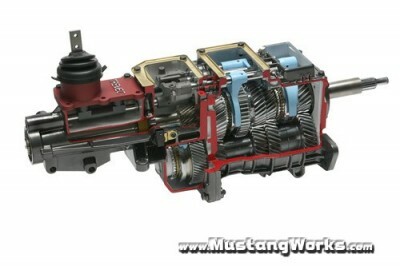 The new line of TREMEC TKO 5-speed transmissions was designed with flexibility in mind. The unique internal shift-rail system accommodates up to eight different shifter locations, ranging from 14" to 27" from the face of the bell housing. An optional shifter provides a 2" offset, left or right of the centerline, virtually guaranteeing a perfect fit in any stock console. The rear cross-member bolt pattern will fit both Ford and GM applications. All models come standard with an electronic and mechanical speedometer pick-up. Other standard features include a neutral safety switch and a back-up light sensor. Adding to the flexibility is a high-performance, billet aluminum, short-throw shifter. This specially designed shifter isolates road noise, while providing a clean crisp feel. The shifter has a unique biasing system, which is adjustable to fit any driving preference. Consistent with all TREMEC transmissions, shift stops are not necessary, since the stops are internal to the transmission. "Achieving torque-carrying capacities in excess of 600 lb. ft. from an 83mm box is no easy task," said Jon Vieth, Product Line Manager, TTC. "Sure, we make 18-speed transmissions rated at 2,050 lb. ft. but you can't put one of those into a passenger car. In order to achieve the desired torque capacity, we went to a higher alloy steel (4615) on all gears and shafts, increased the diameter of the output shaft to a 31 spline, and eliminated the woodruff keys on the countershaft by going to a one-piece design from the previous three piece. The shift forks were completely redesigned and are now all made from cast iron and use a three-pad contact system, virtually eliminating any deflection", continued Mr. Vieth. According to Jim Averill, Marketing Manager TTC, "The redesign of the TR-3550 transmission product line officially started nearly two years ago when we held a focus group meeting to obtain customer input. We gathered additional input from our distributors and the two racing schools (Bondurant and Panoz) that we sponsor. All of the feedback supported our findings from the customer focus group. With the introduction of the all new TKO-500 and TKO-600 in early March, we can deliver a 5-speed overdrive transmission sure to fit just about any application, including street rods, muscle cars and kit cars. The optional gear ratios make the TKO perfect for street, strip and road racing."